Professor Alan M. Dershowitz is a Brooklyn native who has been called “the nation’s most peripatetic civil liberties lawyer” and one of its “most distinguished defenders of individual rights,” “the best-known criminal lawyer in the world,” “the top lawyer of last resort.” He has been named America’s most “public Jewish Defender,” -- “the Jewish state’s lead attorney in the court of public opinion.” He is the Felix Frankfurter Professor of Law, Emeritus, at Harvard Law School. Dershowitz, a graduate of Brooklyn College and Yale Law School, joined the Harvard Law School faculty at age 25 – the youngest in the school’s history -- and became an Emeritus professor after 50 years of teaching and 10,000 students. 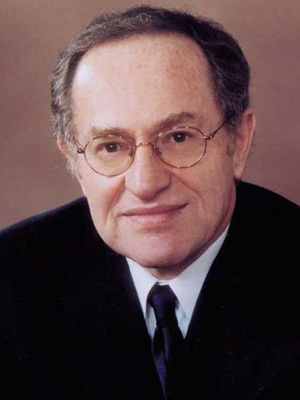 Dershowitz has been called the “winningest” criminal lawyer in modern history and has argued hundreds of appeals in courts throughout the nation. He has won the vast majority of his homicide cases and has never lost a client to the death penalty. He continues to consult actively on both transnational and domestic criminal and civil liberty cases. He continues to devote half of his practice to pro bono cases and causes. His writing has been praised by Truman Capote, Saul Bellow, William Styron, David Mamet, Aharon Appelfeld, A.B. Yehoshua, Elie Wiesel, Richard North Patterson, Steven Pinker and Henry Louis Gates, Jr. More than a million of his books—translated in many languages -- have been sold worldwide. He has also been the recipient of numerous honorary doctor degrees and academic awards including a Guggenheim Fellowship for his work on human rights, a fellowship at The Center for the Advanced Study of Behavioral Sciences and several Dean’s Awards for his books. He is married to Carolyn Cohen, a Ph.D. psychologist. He has three children, one a film producer, one a lawyer for the Women’s Basketball Association and one a professional actor. He also has two grandchildren, one a college senior at Harvard and the other on the way to medical school.